You may have noticed that Strider shares a characteristic with TrotBot - we designed both mechanisms' "hamstrings" to lift high to increase step-height for rugged terrain performance. 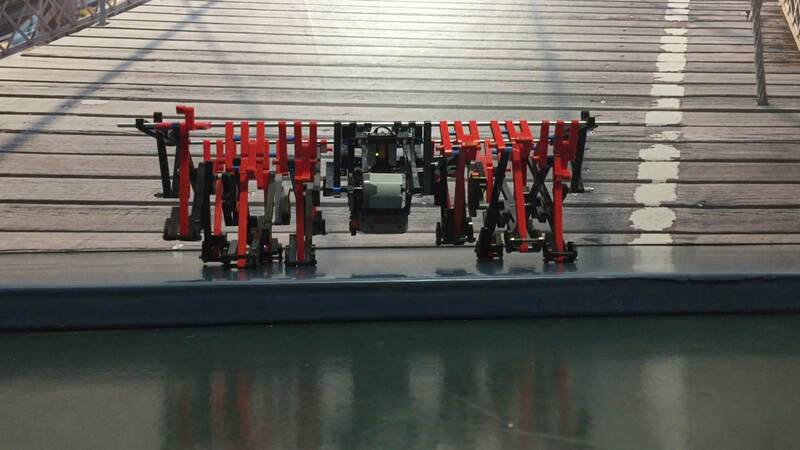 For a smoother gait, Strider should be built with 12 legs, so the following simulations are of one side of 12-legged Striders, with the speed and height set by the robot's front legs. When building a simulated linkage in LEGO, remember to use beams with one more hole than the bar's length. 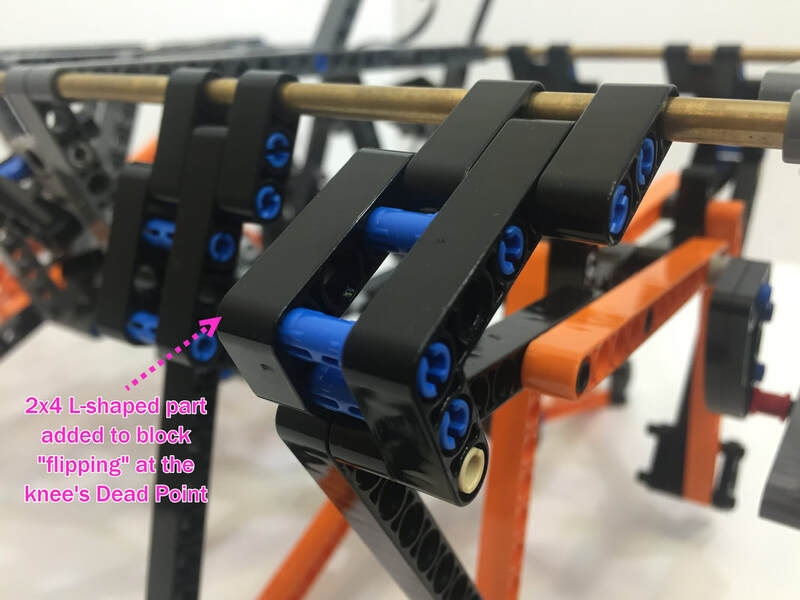 For example, a bar of length 8 requires a LEGO beam of length 9, because when determining the length of LEGO beams, the first hole is always counted as zero - otherwise you can't use the Pythagorean Theorem or Law of Cosines to solve for LEGO beam lengths. ​Version 2 has a short leg-base, which makes it prone to flipping backward when climbing. 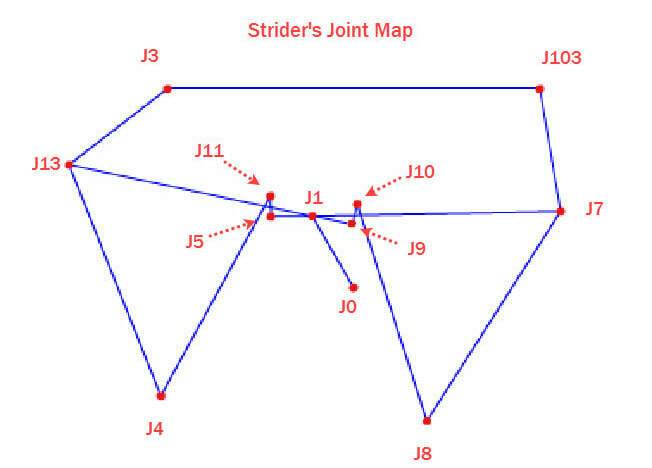 ​The variations explored on this page lengthen Strider's leg-base by moving the X positions of the upper frame connections two units further from the crank, expanding the distance between them from 18 to 22 as shown in the image below. 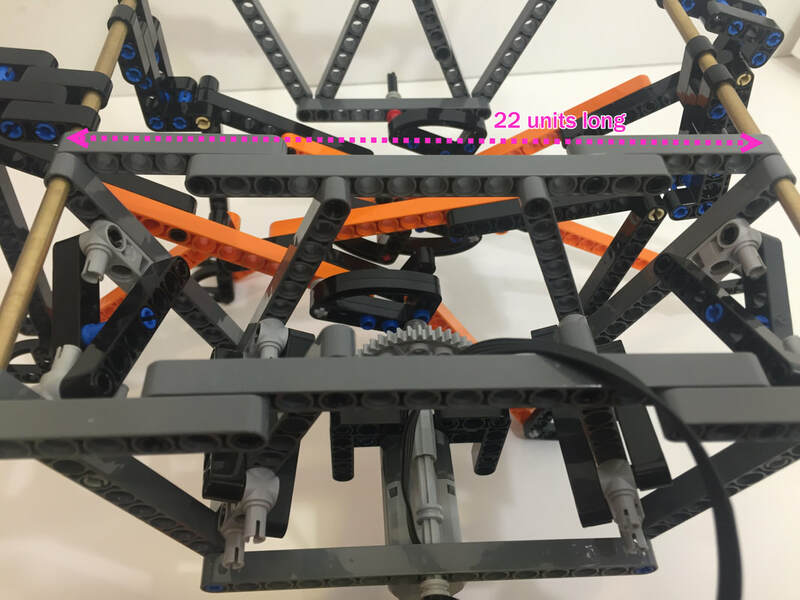 Note: LEGO's integer-based beams can make it tricky to find diagonal beams of the correct length to strengthen frames. ​You can find some ideas for creating strong, triangle-based frames in LEGO here. Note: For all the variations of Strider analyzed on this page, the foot-speed plotted in the above right graph is the speed without adding toes. ​Notice in the below image that when the foot touching the ground transitions to the next foot there is a bump in the gait, which possibly could be smoothed by adding feet with springs like the Mondo Spider uses, or perhaps by adding some sort of shaped foot, like the example with toes below. The simulated toes have a length of 2 units, angled at 125.5 degrees relative to the leg's inner bar. 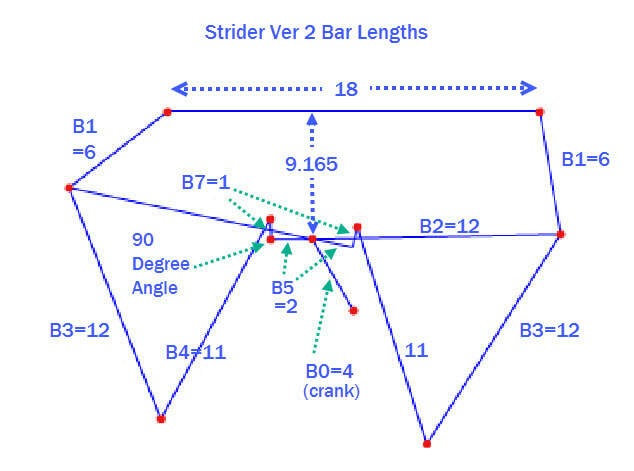 The LEGO approximation of Strider Ver 3 can be smoothed with the slightly more refined linkage simulated below, the dimensions of which can be found on Strider's linkage plans page. Also, the gaits of larger-scale Striders can be further smoothed by adding shock-absorbing pads to the bottom of the feet, which is explored in this blog post on shock-absorbing feet. 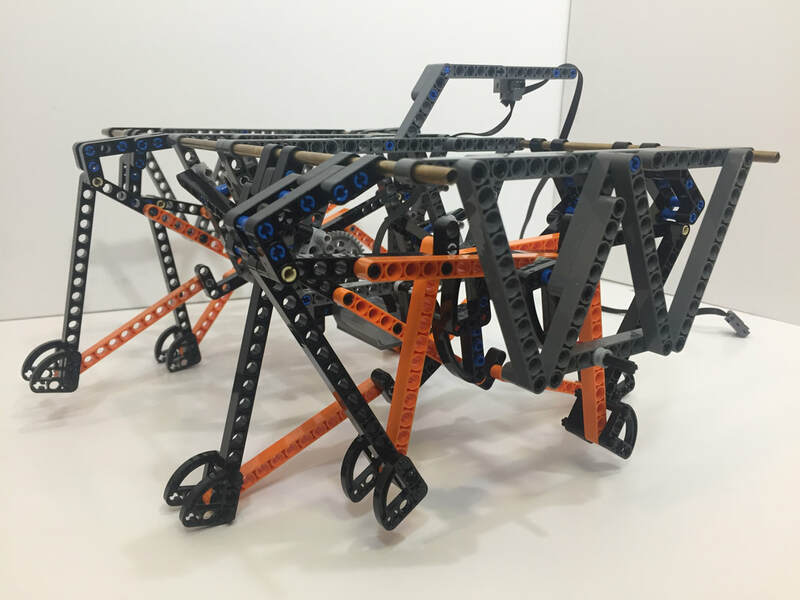 You can find other ideas for creating strong, triangle-based frames in LEGO here. 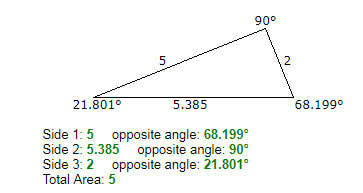 In some of the following variations the upper bar B1 was set equal to 5.385. B1 is the bar above the knee (the femur?). This part length is created in LEGO by attaching a beam to a 3x5 L-shaped part to make a 3x6 L-shaped part with a hypotenuse of length 5.385, as shown in the image to the right. Variation 4 with its 3x6 L-shaped "Femur"
Variation 4's 3x6 L-shaped "Femur"
​Other examples of managing Dead Points are shown here. Here's a quick test of Variation 4, prototyped in LEGO with 8 legs instead of 12. Toes were added to smooth the gait a bit, but rather than mounting the toes to the front of the "shin", they should have been mounted to the inside beam of the leg, like how Strider Ver 3's toes are mounted - see the simulation below the video. ​In all the following variations the toes have a length of 2 units with an angle of 125.5 degrees relative to the leg's inner bar, just like Strider Ver 3​'s toes. Since the bump in the gait occurs when transitioning from one foot to the next, Variation 7's gait could be smoothed by adding shock-absorbing pads on the bottom of its feet, which is explored in this blog post. While Variation 7's speed drops somewhat on the right side of the speed chart, that's partially because it's a plot of the speed without adding toes. Adding toes increases the foot-speed on the right side due to the rotation of the toe as the foot is lifted off the ground, which reduces how much Variation 7 waivers left/right in the "treadmill" GIF above. Variation 8 could be a candidate for a foot with a curved bottom that was optimized to offset the rise in the middle of its foot-path, which is briefly discussed in this smoothing gaits with shaped feet blog post. 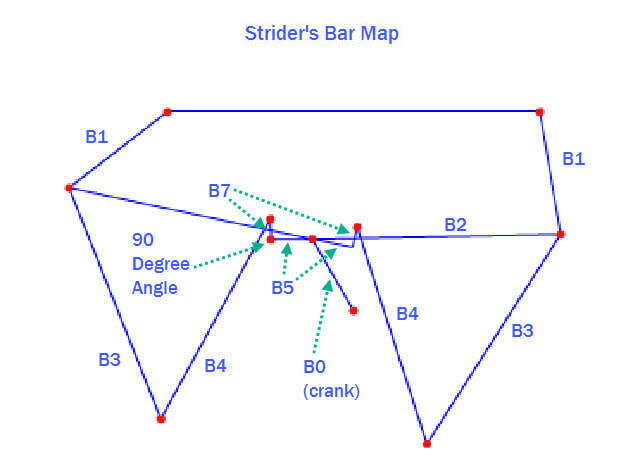 You can quickly check how changing Strider's bar lengths affect its foot-path with the below simulator, but remember, just because something looks good in a simulation doesn't necessarily mean it will work well when built - at least not without some tinkering. Also, Strider's knee joint will flip at its dead point if your build doesn't prevent it. First, here's a video of a simulator in action - two embedded simulators are further down. Below are the embedded simulators. You can also run the simulators on MIT's site where you can access and modify the code. UPDATE: MIT released Scratch 3.0 on Jan 1, 2019, which currently doesn't allow variables to be set above 100 with the slider bar, nor decimals, meaning to more finely tune Strider's linkage you will need to be modify the Scratch code - for now at least. Below is the simulator for LEGO-friendly bar lengths. 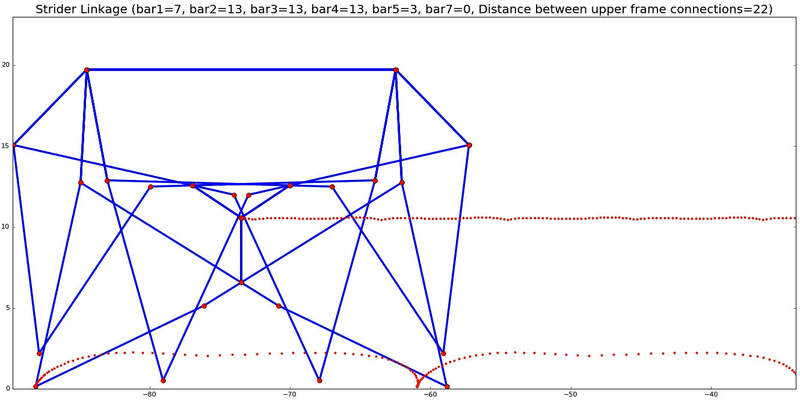 A description of the algorithms, and how we used them to calculate Strider's linkage, is here.